To change the size of the thumbnails in your gallery go to the Options step and select the Thumbnails tab. In the Thumbnail size section there is a Width and Height field. These fields represent the width and height of the thumbnail images in pixels. You can enter any values in these fields. But the actual size of thumbnail images in your gallery depends greatly on the thumbnail resize method you choose. 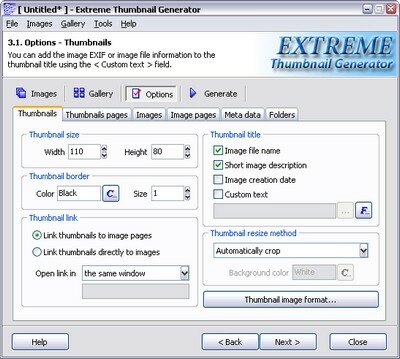 All thumbnail images in the gallery are saved in the JPEG format, using the thumbnail image format settings.